Fish and Game. 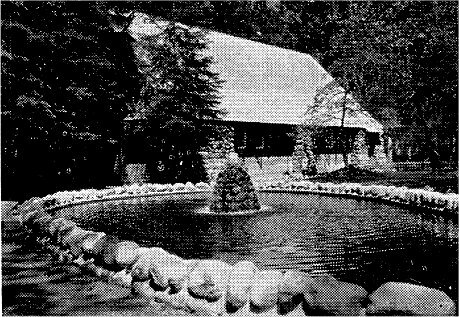 Prior to 1927, trout for distribution and introduction into the streams and the lakes of the park were shipped in from other areas or were reared in the Wawona hatchery, which was built in 1895 by the Wawona Hotel Company at Wawona and was operated by the California Fish Commission. Visitors are welcome at the hatchery during the open hours. It is located about a mile east of Camp Curry. Here the visitors are able to increase their interest in and knowledge of trout culture. A large, kidney-shaped concrete and granite retaining pond is situated outside the hatchery building. 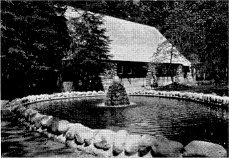 Many large trout are kept in this pool for demonstration purposes only. Within the hatchery there are 54 troughs in which thousands of young trout are hatched and reared. At certain times of the day, visitors may watch the young trout make the water “boil” as they rise to the surface for the food being fed by the hatcherymen. Behind the trough room, there is an exhibit hall where specimens of the various types of trout of the Yosemite waters are displayed in four aquaria. All the trout planted within the park are reared at this hatchery. Over one million trout are raised each year. Most of these are of fingerling size, that is from two to four inches in length, when planted for it is felt that this size fish is more readily able to fit in with the “natural” conditions of our national park than the legal size trout. An agreement exists between the State and the National Park Service whereby at least half the trout raised in the hatchery from eggs supplied by the State must be utilized to plant waters within the park. In actual practice, however, about 80 per cent of the trout reared in the local hatchery are planted in the streams and lakes of the park. Since these operations are conducted by the state, a California State Angling License is required within the national parks of this state. Likewise, all fish produced from eggs secured in the park are available for park use, except that as Yosemite’s needs are filled, excess eggs may be shipped to other state hatcheries, there to be reared for planting in other California national parks. At present (1949) no eggs are being taken from within the park, although an egg taking station is located on Lake Eleanor.